Somewhere in February 2017, I got a call from Dr. Uma for the wedding of her daughter Kangan. We were recommended to her by a friend and she wanted our assistance as Wedding Designers. After a few initial discussions, she called us to Delhi and there we were, in their farm house in Gurgaon, planning every minute detail of the wedding! The festivities began with a grand welcome of the Baraatis at W Goa. For us at CRE, one very important aspect while designing weddings is to use the natural ambience of the venue. W Goa happens to be our favourite as it is very tastefully done. Kangan completely agreed to this philosophy and gave us full freedom to design each function. The Sangeet was centred around the dancefloor which was a combination of two of our style themes form our Lookbook for 2017-2018. Mirror Mirror and Code Red were merged to create the most exquisite dancefloor for her guests. As designers, we always want to do something new, something that reflects the style of our Bride and Groom. Kangan knew exactly what she wanted and was probably the most chilled out bride I’ve ever met. 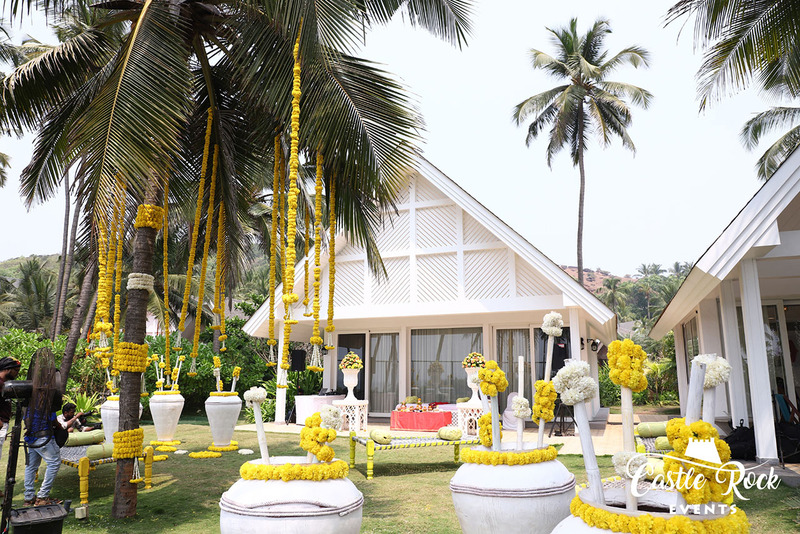 Both the Haldi ceremonies were intimate and took place at the Wow Villa’s. For the bride, we used the white and yellow colour theme whereas for the groom, we worked around the orange and yellow combination. For the wedding, Kangan wanted the beauty of RockPool, the wedding venue, to shine through. The Mandap was to be centre of attraction. Since the venue is on rocky steps, we used minimal props along the periphery. We focussed on a lot of ambience decor and gave the venue a wedding makeover without disturbing the existing ambience. The first time I spoke to Kangan, she had told me one thing specifically that she wanted a lifesize #TUSHANGAN somewhere at the wedding and that’s how we remember this fairytale fondly now. “The Tushangan Wedding” will always be our favourite.